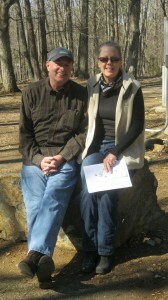 Biology teacher Cindy Davidson tells her husband, Wayne, about one of her most memorable experiences in nature. WD: Can you describe a time, Cindy, when you were feeling a deep connection with the natural world? CD: One experience, I had the opportunity to go with a group of North Carolina educators to Belize, and we spent a night in probably one of the wildest most natural places I’ve ever been: in a jaguar preserve. And we took a night walk and we walked deep into a forest, a tropical forest. We were standing around a little pool, like a wetland, and our guide said, “OK, everybody be silent. Be silent for at least a minute or two.” So we all, and we turned off all of our flashlights. We got totally silent, and for a split second it was silent. But within seconds, the noise of all the frogs—it was mainly frogs, different species—was deafening. Once we shut up, they made their presence known, and it was one of those times that sent chills. I mean it was so loud. They just got louder and louder. Wayne Davidson discusses why it’s so important to get children out into the natural world. WD: It always is important to me with events like this [outdoor HERP celebration] to see it flooded with kids. You know, back in my youth there weren’t the distractions, so you went outside. That’s what you did. And you found salamanders, and you found stuff, and you played around lakes that we had around our house. So we have to make it important to these kids to get them outside somehow, to learn and to play around this stuff. And that’s why it’s so great to have these things and see the kids out here today putting on the waders before we came up here. They’re getting ready to do, tramp-around out there and learn some stuff today. It just doesn’t seem with all the distractions that the kids have today that they have an opportunity to just get out in the woods. That’s what I like at these kinds of things. It’s the kids.